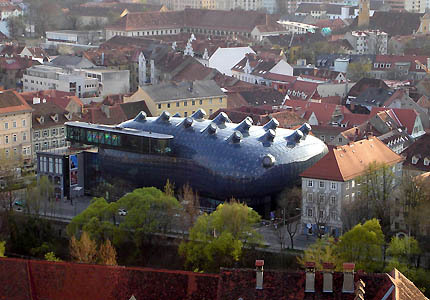 The Kunsthaus was built in order to celebrate Graz’s designation as the Cultural Capital of Europe for 2003, on a budget that is comparatively small for similarly focal cultural venues in large(ish) cities. Graz is the second largest city in Austria, a sprawl that can be appreciated from atop the castle in the center of town. From this location the Kunsthaus stands out like a rather blue, sore thumb. It is difficult to pass judgment on the aesthetic qualities of such a building; it definitely is there, and it definitely is blue and blob-shaped, but it also seems very much a part of the city. You want to hate it, because of what it is: a symbol of the new modernism which has been pioneered by these architects since the 1960s and recently by the likes of architects Future Systems in Birmingham. But it is impossible to ignore how well the building works as a space to display art; and besides which, when up close, or even inside, the building becomes cute and actually quite lovable. Indeed, it has been nick-named ‘the Friendly Alien’. Built primarily of reinforced concrete and covered in translucent warm-blue plastic panelling with white plaster and metal mesh on the interior, the Kunsthaus feels very well constructed despite the low budget. I admired the quirky but thorough logic when I was moving around the building. Everything seems so strange but feels very natural and cohesive. 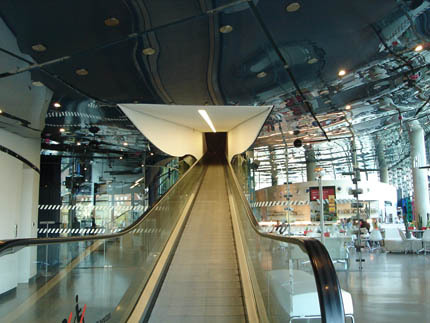 For example, the progressions from ground floor to 1st and from 1st to 2nd are achieved by riding an airport-like travelator inclined slightly, which spans almost the entire length of the building. This gradual movement between the floors somehow controls your progression and gives you time to reflect on what you have just seen. Here, thankfully, one has time to think. At night, the building is a joy because the entire front is covered - behind the translucent blue - with a system of lights that create patterns and display information. It is surprises like this that makes experiencing this building fascinating. It is possible to reach the Kunsthaus from the airport via taxi (I do not recommend the sporadic buses) or by trams within the city – numbers 1, 3, 6 and 7 all stop at ‘Station Kunsthaus Graz’. But personally I recommend finding your way to the river and simply walking along. Open 1000-1800 every day, except Thursday when it closes 2000 and on Mondays when it is closed all day. Admission to the gallery spaces will cost you €6 for adults or €2.50 for students. For more and updated visitor information please visit www.kunsthausgraz.at.